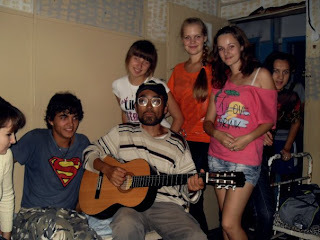 (1,September)FINALLY I LEFT UKRAINE, came to Moldova! Border office gave me Moldavian stamp even no check my face!? ill-natured Moldavian border officer, friendly Transnistrian officer, and (I didn't know there is own currency here!? )trolly bus accepted my hitchhike for free!? 5:30 PM,arrived Tiraspol. Joined Celebration of 20th of Transnistria,by TV-news'interview. ,,By the way,I don't write about my CS-hosts because I can write their reference. .I surfed monastery of Kitskane. Friendly monk showed and explained big and beautiful their site and took me to excursion but in the dark night!? (4,Sat. )Many people are working there but nobody needed my help,got bored so left monastery before mass,Sorry.Back to Tiraspol by hitch. (5,Sun. 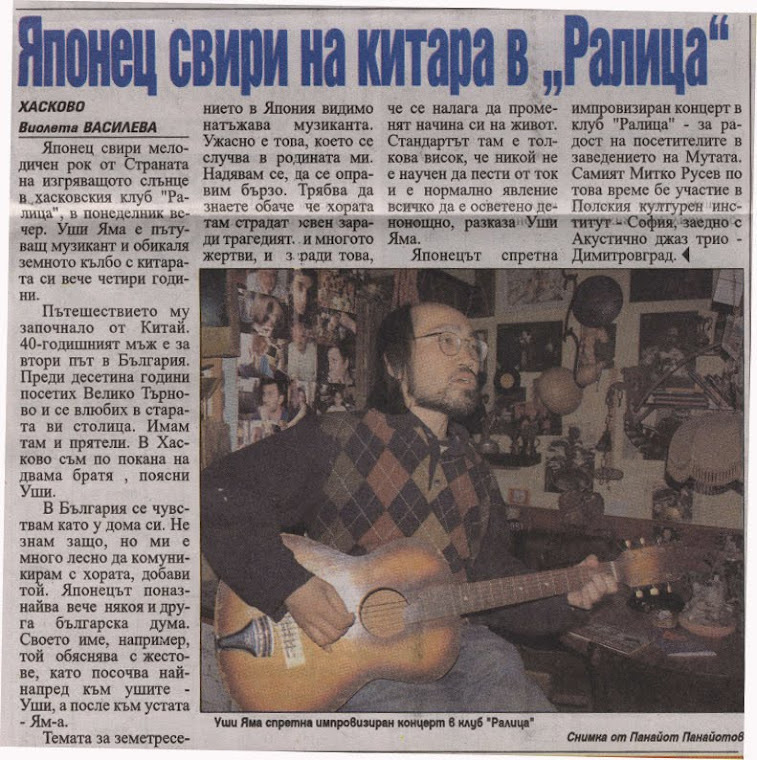 )My 3rd Tiraspol'CS-host took me to popular cafe,but 1st and 2nd hosts were there too,at the same time. 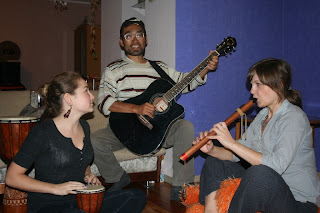 Host's friend is flute master,,after all I surfed master's home. (7,Tue. )Another TV program'shooting about me in his home and town. .I often can't remember even the face of someone whom I met even TODAY. and Today I think I fell in love with someone but I nearly forgot even such feeling soon. .Master explained me about principle of aikido,I had no relation with any martial arts so far THOUGH,surprisingly it fits me,"Not to fight". .Master,his wife(local TV-show's star),and their daughter,none of them are CSer although everyone is real great CSer,,,strange!? I even can't write official reference to them. (8,Wed. ),,Sending CSing mail from midnight till 6 AM, then move to next host at 9 AM then continued sending for hours, to over 100 CSers in Chisinau,,,rainy groomy weather,so I continued computer work all day. (9,Thu. )Actually I was planning to quit writing blog THOUGH,suddenly a Moldavian CSer Jacob sent me mail with link of USHI BLOG on Google!?!? Thanks for making it with surprise!? ,,He might be able to write my blog instead of me?? .Some people give me fun time even before we meet by contacting e-mail. One of Transnistria' CS-host(not in Tiraspol) and I still can't find which day we can meet? Today he sent me mail "You can come Today from now by hitchhike" but it's already 8 PM!?!? (10,Fri. )from 9:30AM,started to sending e-mail----soon it became 6:30PM. .Bad physical condition,but God of Travel doesn't allow me to be alone,somehow today also I met someone new people. .Young people were gathering on Friday evening's street,even so it's peaceful,I was tired of big population's Ukrainian jungle,so this capital but small city comforted me much. (11,Sat. )Ushi on Transnistria's morning TV program broadcasted,but even Chisinau's people can't watch it. .My host also invited her teacher to meet me. .I'm CS-addict but more,Meeting-addict with anybody? .Sorry Jacob but I don't have time even to check How my new blog website that you made works!?!? .It was so comfortable to be with the host THOUGH,suddenly the host told me "What is sense of your travel? It seems nonsense." so I had to say "None of your business!" 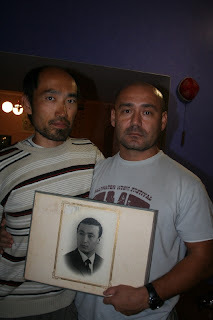 .Tonight's host is non-CSer,and someone non CSer is waiting for me in Tiraspol,both are friend of friend of CSer. ,,,I might go to Chisinau from October? (14,Tue)Back to Tiraspol only 1 car easily,but easily or comfortable is not interesting for me. Unexpectedly meeting with my non Cser' host for after 2 days,thanks even inviting me to nice dining cafe THOUGH,I couldn't conquer my bad condition,I was just exhausted to be sociable but they don't know it,after all I was impolite to them,,,actually it often happens to me,,,After all,our contact had stopped then. Shut myself up again in same host's room again. .Received a moving e-mail,at the same time,my simple dream (of going back to previous country) is over. I don't write about it because blog is not diary. .Not far from town but Dniestor river is so beautiful and calm like a lake. I couldn't stand up from there until get to dark. I'm still keeping shut myself up in host's flat,Sorry. ,,Someone phoned to host so I answered it by Russian "He's not at home now,I'm his friend.Sorry,I can't speak Russian.He will come back in the evening,I will tell him,You can call in the evening.Excuse me,what is your name? ",,,Oh,at least I spoke by Russian now?? .I have been losing my way of travel but,Thanks for meeting me to Olex as a messenger from Lviv,Ukraine. OK,after Moldova I will go there because you're interesting. but my plan in Tiraspol today are,,meeting with a CSer from Ukraine again 12:00,attending to lesson in school 14:00,joining someone's birthday party 17:00,,,I don't think I can go Bender today,besides suddenly paticipating gymnasium's outing in Tiraspol was decided. After all,I hadn't gone to Bender and I don't write HOW MESSY that afternoon I was!? even if it often happens to me,I was collapsed by my own plans,for example I had a few meetings at 5pm at once!? 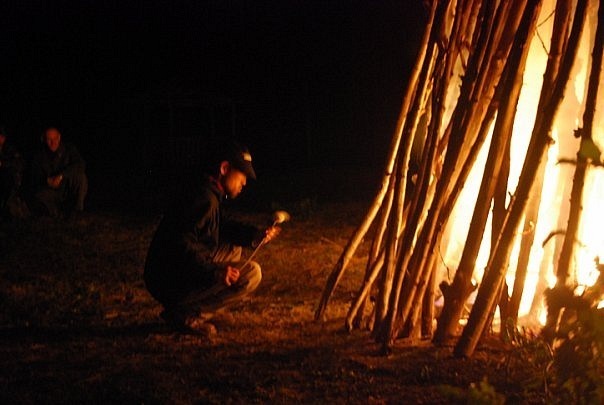 (18,Sat)GO to forest with 600 gymnasium students,then campfire for over 3 hours till midnight. (19,Sun),,came back inside city. Thanks for hosting (and help me to separate from CS-addict),English teacher! even if it's by Hospitalityclub,ANYWAY. (20,Mon),,Is it wrong if I was still in Tiraspol? ,,,Because I was tired and I like this small capital,,I even tried to send e-mail to many Hospitalityclub members heere. .Just walked and napped in town all day,like my summer days in Ukraine,but it's already rainy autumn here. Surfed flute (and aikido)master again. I phoned to many HC-hosts but they answered "I don't know you,What is HC?" ,,,so I slept night oustside. (24,Fri)Tiraspol---Kalagash,,I asked hosting to worker in shop,she took and host me to countryside. (25,Sat)Bendrey,,HC-host but his drunken friends let me drink some drug and I was knocked down. (26,Sun)Bendrey,,I asked and found host on the evening street. (27,Mon)Bendrey,,I found host on the street but then,after visited to home I was cancelled,but I found another host on the evening street. (28,Tue)Bendrey,,Met Japanese samurai in park,he became tonight host. MY REGISTRATION IN TRANSNISTRIA IS STILL VALID. But finaly I left there!